Kirby's Farm Market is open right up to Christmas. Get ready for the holidays with wonderful gifts and ornaments, quality produce, wreaths, poinsettias and the perfect Christmas tree. And we can help with your last minute shopping on December 24th too! Homegrown and Locally Grown: For the rest of the season we'll have apples, potatoes, onions, cabbage, garlic, and winter squash. Ask us about our apples that have been in special storage to keep them as crisp and juicy as the day they were picked. You don't have to eat soft mealy apples just because it's December. Decorating for the Holidays: poinsettias! Our greenhouse is full of beautiful holiday color. We have hundreds of plants in a range of sizes. 4.5" pots are the perfect gift for teachers and friends while 10" pots create an impressive splash of color for home and office. Choose traditional red or white, marble (pink and white swirl), jinglebells (red speckled with white) or pink. Find the perfect Christmas Tree! Take a stroll between the market and the greenhouse where an evergreen forest has sprung up over night. We have over 100 trees to choose from. We also make our own wreaths in a variety of styles. 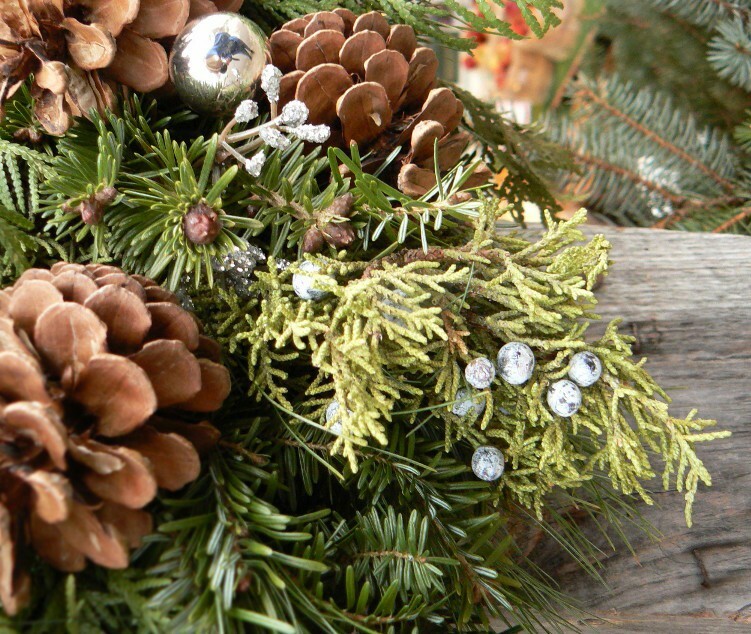 Our specialty: luxuriously full wreaths handmade at Kirby's with mixed greens; artfully arranged holly, cedar, pine, fir and eucalyptus create a truly unique display. For those with an interest in holiday sparkle, we have wreaths decorated in combinations of red, gold, silver, blue, green and white. Or just plain, sweet-smelling greens with a bow. Talk to us about having a wreath made for your home - we would be happy match the holiday theme of your choice. Like us on FACEBOOK to keep up to date on our end of the year specials and sales! The farm is such a busy place, it's really difficult to pick one thing to write about! A few upcoming posts will highlight what's in our greenhouse, our Integrated Pest Management Program (IPM, otherwise known as "good bugs that eat bad bugs") some of our favorite new perennials and native plants, and a crop update, so stay tuned! For now, let's talk about some of the great locally grown gifts we have in the market giftshop. Carrying handmade gift items adds a bright spot to our day. We like seeing the displays of pottery, baskets, knit items and purses, created by our friends and neighbors instead of in a factory overseas. Please keep these folks in mind the next time you need to buy a little something for a special gift! Deborah Wilson was our very first featured local artisan, and her pottery is definitely on the best sellers list. Beautiful bowls, plates, mugs, casseroles, teapots, and pitchers in gorgeous glazes of blue, green or brown. Brooke Albanese of I Feel Like Dreamin' uses decorative paper to create stylish picture frames and little gift boxes. This year we're also excited to have hand knit items from Brooke. Felted bowls and baskets, cup cozies (keep your hand cool and your drink hot!) and wash cloth sets. The colors and textures are beautiful. Sue Gaylard of Pursenality creates colorful quilted handbags that are so much fun! The patterns are great and they come in all sorts of themes. Bright and cheery or soft and subtle, a great way to make your wardrobe more interesting. We are also featuring the basket weaving of Jan Ferries. Unique, one of a kind baskets, no two are alike. We love the leather or wood handles, different textures and colors. Our goal is to increase the percentage of items from local artisans every year. If you or someone you know is interested in working with us, just give us a call (585)637-2600 or bring in a sample. 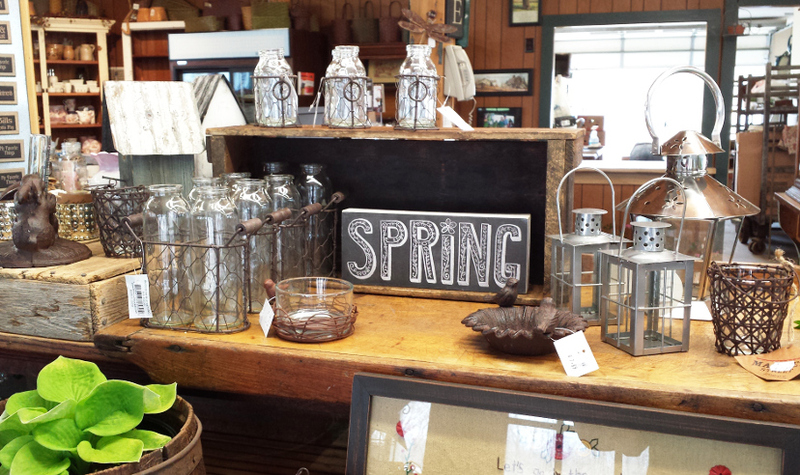 It's an exciting time of year here at Kirby's Farm Market! I must confess, I say that a lot. It's hard not to - after Spring comes Summer, and then Fall and Winter... how can I restrain my excitement with an endless parade of seasons, each more delicious then the last? Asparagus, strawberries, peas, then peaches, tomatoes, peppers, and sweet corn, apples, squash... oh my! Hungry yet? And that's just the beginning. I'm sure you all know how I feel. We saw the signs when we posted about the arrival of our first annuals on Facebook, back in April. Even though there were weeks and weeks to wait, we know you're just as excited as we are. May 1st. May 1st is a phrase that's heard frequently, December through April. Everyone wants to know when the market will be open, when will they get that first peak in the greenhouse? Or that first taste of fresh Kirbygrown asparagus? Even as we close our doors in December, "May 1st" is spoken about a hundred times to customers wanting to know when it will all start up again. A new year, a new season, a new array of challenges, accomplishments and miracles. As I write this post, May 1st is just a few days away. And let me assure you, there's quite a hustle going on right now! So many things to pack into this last week. So many displays to make just right. One thing that was finished right on schedule, ready for opening day, are the renovations to the front of the market. Maybe you noticed a little bit of construction going on at the market if you've driven down Ridge Road lately. Our usual displays of garden tools, country gifts and Spring décor will look especially nice with new windows and doors as a back drop. 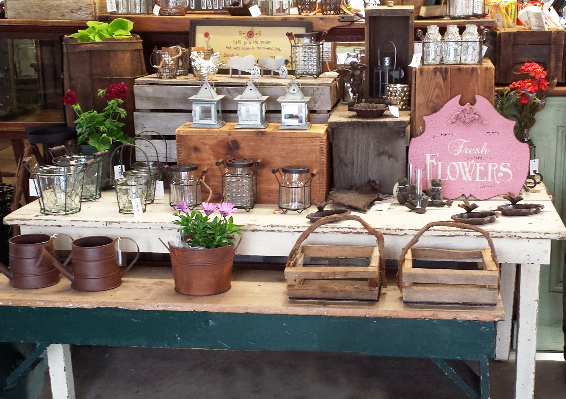 The greenhouse is so gorgeous this time of year, full from wall to wall with perfectly beautiful plants. It's hard to resist filling your garden with color right away, but we all know the danger of frost in this area. Don't worry, you can visit the greenhouse whenever you want to, until it's safe to plant! If you must buy now, you can join the group of determined gardeners that move their plants in and out of garages until the time is right. There are a few annuals that tolerate cooler temperatures - check back for a post on the subject in the near future! Meanwhile, on the farm: it was only about three weeks ago that the warm weather had asparagus shoots beginning to poke out of the ground. Last week some of the stalks were amazingly tall, as tall as I've ever seen it! There will definitely be plenty of asparagus to start us off this year. As asparagus season goes into full swing, we'll be keeping a lookout for recipes. Do you have any favorites you would like to share?